Since my recent return to the UK it has been getting progressively colder and in the last day or two the snow has started falling in earnest. Most galling is that almost all my skibike kit is stored at Geneva and even my SnowBlades are getting a well deserved pass through the sanding belt at Finches in Forest Hill. 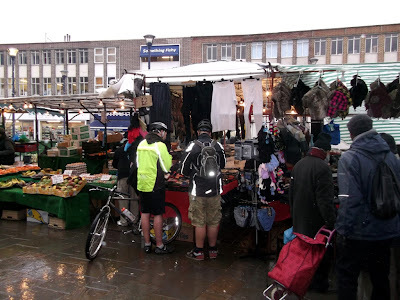 This Saturday was in my diary for me to lead my second RetroBike tour around London, a long but relatively gentle ride around the parks, cycle lanes and canal footpaths of the capital. It looks like it will become a regular event, each ride brings in both new riders and those who have come back for another go. 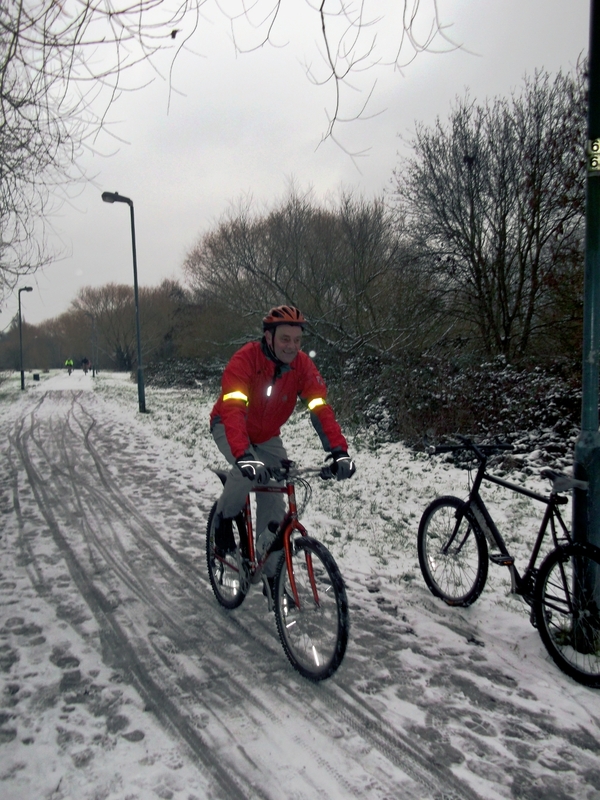 With the recent snowfall it was looking to entail a fair amount of riding on snow, something I have done a couple of times before, but am still very much a novice at. The evening before the ride the forecast looked bleak and a number of riders made last minute bail outs. I began to doubt my own judgement too, so made a 6pm risk assessment, with a quick ride up and down my street. With 2" - 4" of crunchy compacted snow on the street, the riding was surprisingly good, the one sketchy bit was where the local kids had been sledging and reduced the surface to ice. The following morning I awoke early and made a flurry of early morning texts and calls. Tim, facing a long drive up from Bournemouth, whilst hung over, wanted hard facts, I gave it a 50% chance of crashing out at some point. Dan, from Guildford had similar conditions, but was keen to carry on regardless. 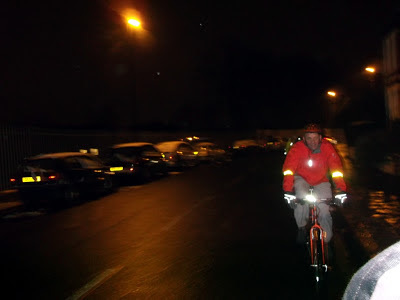 Whilst Andy, from the posh side of Purley, was still keen to go, providing it wasn't going to be some macho endurance race. On this cold, grey day amidst occasional flurries of snow, we gathered at East Croydon station and headed once more into the snowy wastes of South London. Luckily the riding was still good with crunchy snow under the tyres and not the slush over ice that you might have expected. Luckily all our bikes were shod with knobbly tyres and we all seemed to be keeping well without any spills. 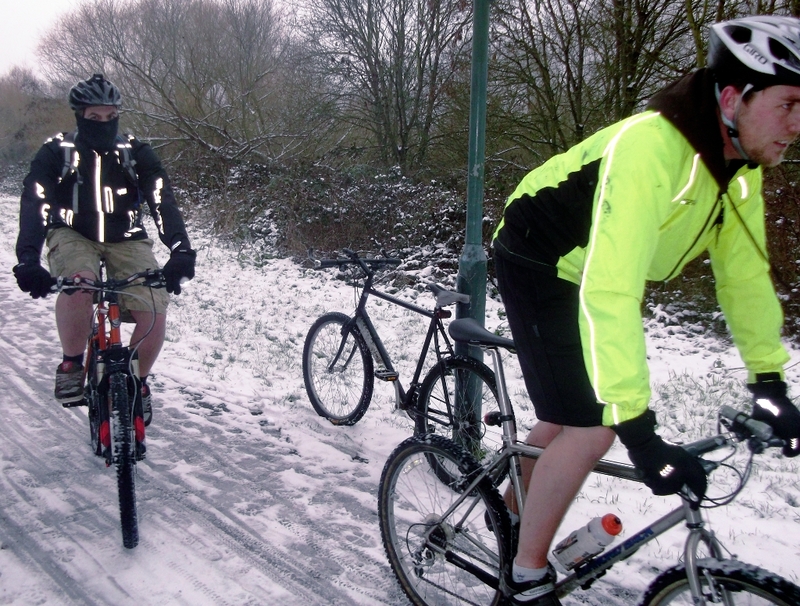 Heading out of Catford, the cold got to Tim and Dan, who's socks were not up to the task of holding in warmth whilst riding, so a detour to Lewisham was needed for an emergency sock stop. The High Street provided a TKMaxx, but no Millets or similar outdoor type shop. 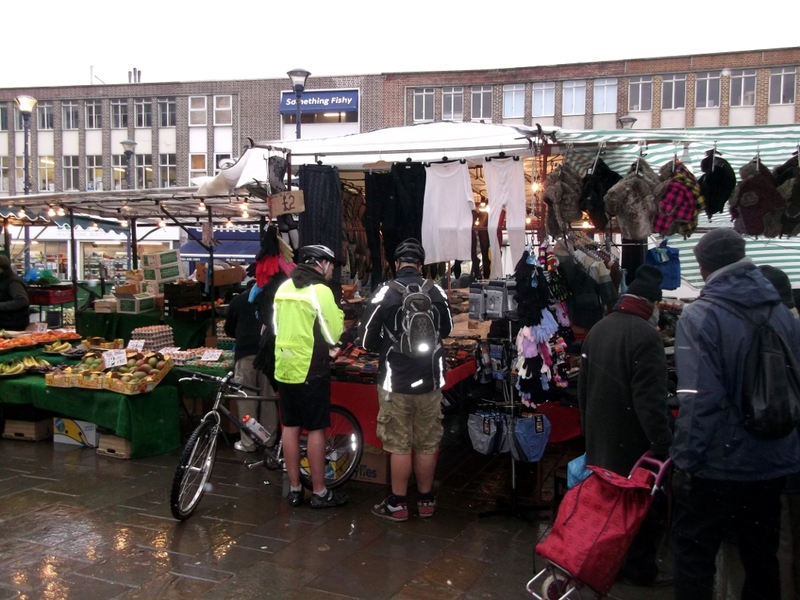 A fellow cyclist recommended one of the market stall holders who had tog 2.4! socks available, the pricing of which involved some new form of mathematics that even Stephen Hawkins may have had trouble with. A quick sock fitting session ensued, the sartorial results looking like a hybrid between Leroy Johnson from Fame and Nora Batty from The Last of the Summer Wine. Hypothermia averted, it was time for a quick slog up the hill to Blackheath, where we were greeted with some fairly unpleasant driving snow. 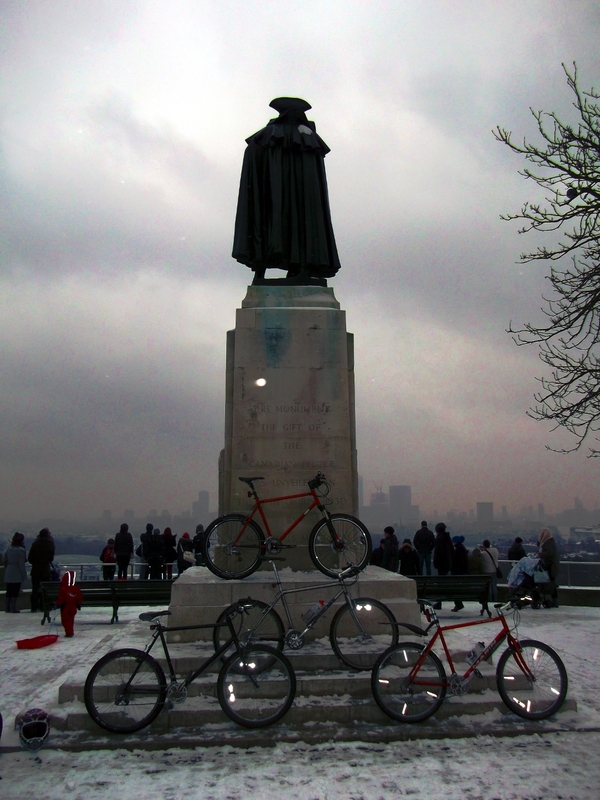 Hastily we made our way to the statue of General Wolfe, overlooking Greenwich for the obligatory photo opportunity. Before we cooled down too much, we made a downhill run for Greenwich and the lure of pie and chips. Fortified it was time to head over towards Stratford for a glance of the Olympic stadium. The local drivers displayed some pretty psychotic behaviour (wouldn't happen South of the River) which met with a robust and assertive response from Tim. 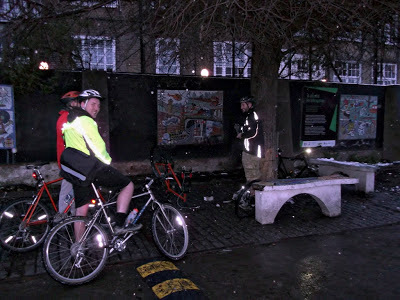 As the general consensus was to get off road as soon as possible, we headed West and joined the canal network for a bleak but fun ride up the Regents Canal tow path towards Islington. We whizzed past the groovy hipsters, strollers and sundry tourists, clearing a path with my quacking front brake. "Furthest distance travelled" was picked up by Tim, who had driven over 120 miles in foul weather to take part. "RetroBike du Jour", was a close call between Tim on his Diamond Back Axis 94 and Andy on his Marin Pine Mountain. Tim pipped Andy at the post, just because the Diamond Back looked almost new, with just a few scratches on the lacquer. To take such a nice bike out onto filthy, salt covered roads, shows an inspiring level of commitment worthy of reward. We had hardly left the rest stop before we lost Dan, who had suffered his first puncture of the day. In the fading light a quick repair was made and we returned to street level. What seemed like 5 minutes later we had already passed St.Paul's Cathedral and were heading up The Strand and onto The Mall. Tim sprinted past me to do the "both arms raised" Tour de France finish line glide through Admiralty Arch. We had a few minutes break at Buckingham Palace, but with the onset of night time it was getting distinctly colder and simply had to keep moving. We upped the pace through South London to warm up and give "the youngsters" a chance to stretch their legs out a bit. On a bit of head down climbing towards Crystal Palace, the word came through that we were Danless once again, a phone call and some back tracking found him with a second puncture. There were no obvious signs of glass in the carcass and as he was running top quality Schwalbe tyres, we began to wonder if the cold had got to the valve seals on the inner tube. 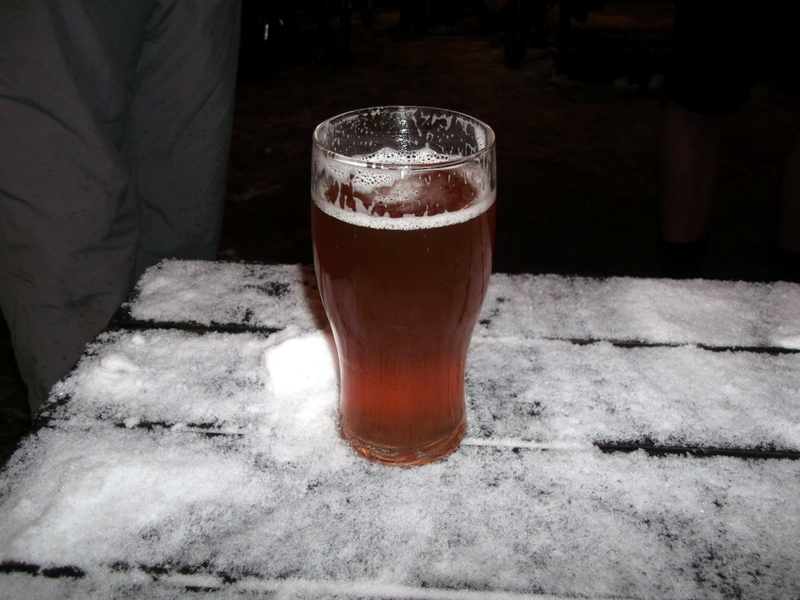 With the home straight in sight we completed the climb up to Crystal Palace for a beer in the snow, courtesy of Tim. 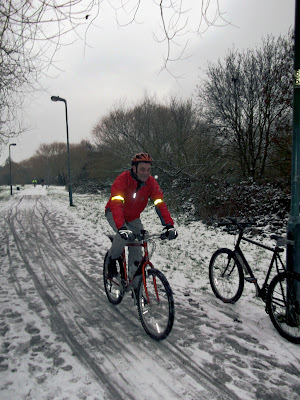 Refreshed, there was a bitingly cold, but wonderful, flat out descent from Crystal Palace back to East Croydon. Tim was dropped off at his car which, surprisingly for Croydon, was still there, then Dan at the station, leaving just Andy and myself to cruise back to Purley. All in, a great days snow riding, in good company, what more could you ask for? Better weather seems to be the general consensus, as there is unlikely to be another ride till March let's hope so.